We've gone through an interesting change in fashion trends in the last few years. It seems like watches really went out of style for a while. As smart phones penetrated the market more and more with people, especially younger people, relying heavily on them, the lowly watch seemed to be seen as a one trick pony and was redundant tech. I mean, who needs a watch when your phone gives you the time whenever you touch the power button? Also, since we are always looking at our phones anyway, and the time is usually seen at the top of the screen, why would I want a watch that I have to make an effort to look at? Then the fitness band/tracker craze set in. Suddenly the same wrists there were bare a few months before were now sporting these new sleek rubber bracelets that not only functioned as watches, but let the user track all kinds of fitness data as well. Now I had a problem with this new craze. To me, watches are gadgets. That means that I've worn a watch for as long as I can remember. Ever since I've been able to afford more than one, I've worn multiple watches. I sleep in one, I shower in one, heck the only time I'm not wearing a watch is when I'm taking one off to put on another. I've grown accustomed to the feeling of a watch on my wrist and when I'm not wearing one, I feel a bit unbalanced. What does this mean? In short it means that I wasn't able to embrace the band/tracker craze because no matter how cool they were, they didn't feel like a watch on my arm. I needed the weight and heft of a watch. Then, in the last 6 months it seems that several companies begin releasing the "combo" product I'd been waiting for. A watch footprint with the fitness tracker heart in it. 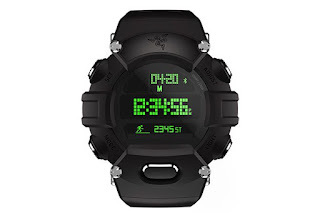 After looking at several, I settled on the Razer Nabu Watch Forged Edition (pictured above). It comes in a basic black edition (one of my main demands... if you know me you know my affection for black). It does all the things you'd expect of a digital watch. It also does all the things you'd expect of a fitness tracker. Combine all of the above with a dual LED screen which features one traditional LED green screen and one OLED green screen and you've got a winner in my book. The device also has an app that connects via Blue Tooth to my iPhone. The app allows me to control all aspects of the watch from my phone. By that I mean I can set the alarms (there are 3 of them), set the second time zone, determine if my phone synchs its time function with my iPhone (as someone who travels I can't begin to tell you how wonderful that is), charge the OLED (7 day battery life)from my computer or a USB AC adapter, etc. Could it do more? Sure. I know there are band form factors out there that do more from a fitness standpoint, but none of those have the heavy black form factor that is similar to a Casio G-Shock. I've had the Razer Nabu Watch for about 2 weeks now and am very happy with it. It is a highly recommended product. Interested in checking one out? You can follow this link to get all the details. Razer also has all kinds of incredible products that are designed with a focus on aesthetics and the color black. Check them out & be prepared to be amazed. I was.